But, also the Watermelon Glow Sleeping Mask was a stand out product for me last year - it made my Favorites of 2018 products! And just so we touch on the whole line, I love the Glow Jelly Sheet Mask as well - I've reviewed it here! 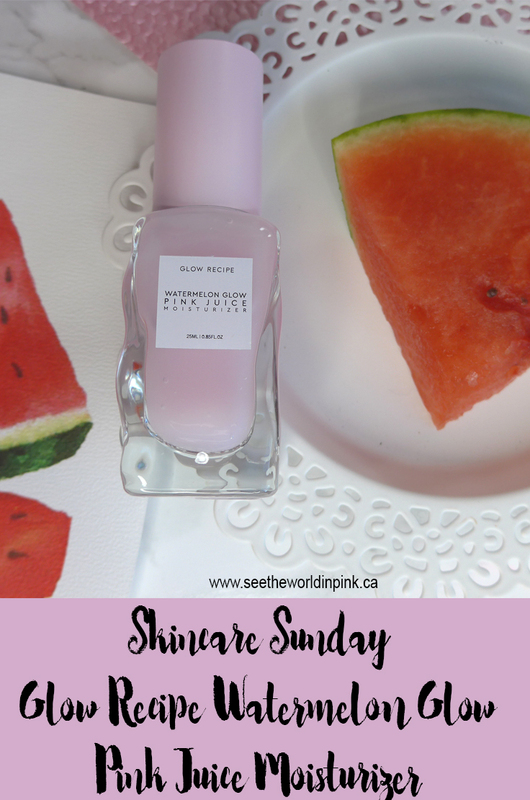 Glow Recipe Watermelon Glow Pink Juice Moisturizer ~ mini size shown is $28.00 CAN (full size is $50.00 CAN). A lightweight moisturizer, ideal for oily to combination skin, that is formulated with vitamin-rich watermelon extract, hydrating hyaluronic acid, and soothing botanicals to boost radiance and glow—which also layers perfectly as a soothing serum for dry skin. So, I think it's important to note that this moisturizer is really designed for combination to oily skin; it will likely not offer enough hydration for dry skin! But, if you do have dry skin and your interested in trying this product, then you can easily used it as a serum for a hydration boost! My skin used to be dry; but, it's really changed to combo/oily over the past 2 years, so this is perfect for my skin type! This whole watermelon glow line smells like artificial watermelon, so if you aren't in to scented products, you may not like this. I happen to love the smell of this product! I also love that everything in the line is a cute light pink! My only complaint is that the mini size packaging does not come with a pump; but, I believe the full size does. I just would have like a better applicator - this just has a stick in it. This moisturizer has a gel texture that is a little cooling when applied - it is meant to be hydrating for the skin; but, also calm and brighten the skin! I personally love the gel texture of the moisturizer - it feels really lightweight and gentle on the skin! It applies really nicely on me and absorbs quickly - it does leave the skin with a slightly tacky feeling for a few minutes after applying, so I wait a few minutes before applying my makeup! I do think this is a really good moisturizer for oily skin - I think it will be even better in Summer for me! It delivers moisture to my skin without feeling heavy on the face at all. It has overall helped improve my skin tone overall. It has been an easy go-to every day moisturizer for me. I do only use this during the day and it's perfect for that! Overall, I'm super happy with the Glow Recipe Watermelon Glow line - they are really helpful for glowy, moisturized skin! If you have skin on the oily side and haven't settled on your favorite moisturizer - I would recommend this! I picked up a mini to try it out, so it's a great way to try it out!